Our Lady appeared in Zeitoun hovering above Saint Mark's Coptic Church, a shrine dedicated to the Holy family, which according to tradition rested in that place during their stay in Egypt. The apparitions, ( hundreds in number ) took place at night, and Our Lady was always surrounded by light. The Coptic Church celebrates 32 feast days in honour of the Blessed Virgin Mary. The last day falls on 2 April, and commemorates Our Lady under her title, Our Lady of Light. 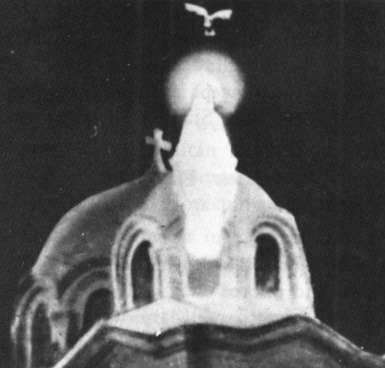 At 8:30 p.m. on Tuesday 2 April 1968, She appeared on the roof of the Church in a kneeling position, surrounded by light. The first man who saw her, Muslim, Farouk Mohammed Atwa, was undergoing operations for a case of gangrene. The following day when he went to hospital for his scheduled operation, he was certified completely healed. (Reported by Watani, an Egyptian newspaper, 21 April 1968) Other devoted women saw her and recognised her as Our Lady. The first apparition lasted only for a few moments. For the next three years Our Lady appeared on many occasions especially at night, and sometimes she was accompanied by white doves that would fly around her. May lights would be seen in the sky preceding the apparitions as if beautiful diamonds made of light were dropping from the heavens. The first two years she appeared about two to three times a week. These apparitions attracted large crowds by night, sometimes up to 250.000 people, they were Christian, Jews, Moslems, unbelievers and many others, it was a gift of Our Lady to all the nations. The apparitions finally ended in 1971 leaving an atmosphere of unity and peace and many people received miraculous healings there. The apparitions were approved firstly by the Patriarch of the Coptic Church in Egypt, and later on they received approval by the Roman Catholic Church. Roman Catholic Cardinal Stephanos did all the investigations and submitted them to Pope Paul VI in May 1968, who approved them as a visitation of the Mother of God. One remarkable thing about these apparitions is that Our Lady was visible by everyone and she allowed photographs to be taken. Although no messages were given in these apparitions, Our Lady appeared many times in a position of prayer as if inviting us to pray. The doves would fly and form the sign of the cross, so that Christianity was shown to millions of people of different religious backgrounds for the Glory of God. For more detailed information about Our Lady of Zeitoun, visit this site hosted by Rev. Father Boutros Gayed. This site provides invaluable information for all those who are called to be the children of Mary," the children of God."